In order to comply with the law 15/1999, from december 13th regarding Personal Data Protection, 12 AIR STAC S.L., with CIF B76620079 and domiciled at Rambla de Santa Cruz, 37, 38006, Santa Cruz de Tenerife, informs you that the data that you have provided through the contact form will not be registered in any database. They will only be received in our email account exclusively and will be used by 12 AIR STAC S.L. to contact you and/or reply to your query. By using the form and sending your data you explicitly authorize us to treat that data with utmost confidentiality. 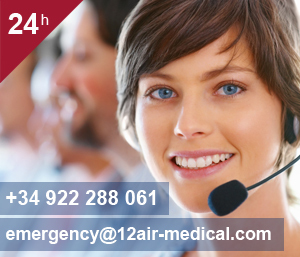 You may write to 12 AIR STAC, SL at the above mentioned address or per email at info@12air-medical.com in order to exercise your rights in regards to access, modification, cancellation and opposition of your data management. 12 AIR STAC S.L. warranties the security and integrity of your personal data, avoiding any modification or non-authorized access to them.